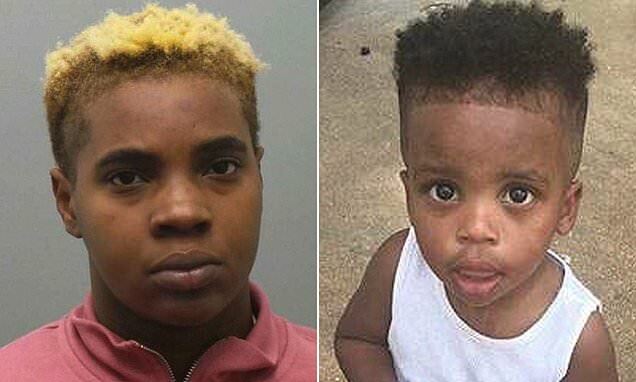 A Missouri woman was charged with first-degree child endangerment on Saturday after her two-year-old son fell from her car, was hit by a truck and died. It remains unclear how little Elijah Roby was ejected from the vehicle in St Louis County on Friday afternoon. Immediately following the incident, mother Ebony Roby put the boy back inside the motor, drove to a Shell gas station on Lucas and Hunt and called 911. The Jennings Station Road (near Interstate 70) incident was reported at 4.48pm and the child was rushed to hospital in critical condition. However the boy didn't make it. The parent was behind bars Saturday after cooperating with the St Louis County Police Department. She was placed on $50,000 bond as the Bureau of Crimes Against Persons investigated, KMOV reported.